Here They Lie was one of the first horror titles to release on PlayStation VR. Months later, it's received a hefty patch that enables PS4 Pro support, standard play on a TV screen up to 4K resolution, and a chapter select. 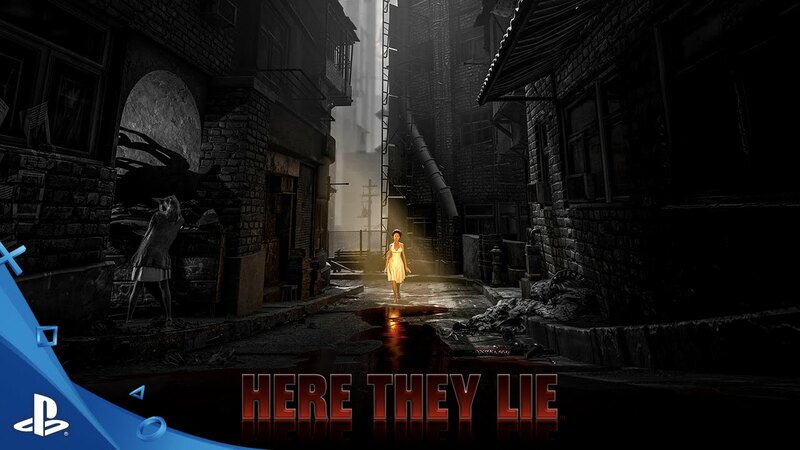 With this new and improved version in place, it's time we look at Here They Lie and find out if it's something for VR owners, horror fans in general, or both. Does Here They Lie wrap you up in a surreal horror adventure, or should we let this sleeping dog lie? Time to find out. Here They Lie takes the esoteric and surreal approach to horror. In the game, you play as an unnamed protagonist who finds himself in a world where everything is, for lack of a better word, trippy. Throughout the story, you'll find yourself in empty subways, tightly packed alleys, and even abandoned neighborhoods. The environments in Here They Lie have a huge amount of variety, but I found myself struggling to understand how they were connected, if at all. There's no denying the style here. It's oozing with imagery that you would expect to see in some kind of horrific art gallery. It's great to look at, but finding meaning in it all is harder than you would expect. Throughout it all, you chase a woman named Dana in a yellow dress. Your interactions with her all have the same general theme, but it's always very vague as to what she's talking about. You'll also find tidbits of story in the form of pictures, phone calls, and notes. Again, these are mysterious, but lack any kind of cohesive connection. At the very least, the phone calls remind you of your goal to track down the woman in the yellow dress. So, you navigate through all of this, wondering if any of it matters, wondering if it's all going anywhere, and then, right at the end, it all makes sense. Now, when I say "sense" I mean that in a light way. I won't spoil anything, but when you reach your final destination, you're given what I would consider a fair explanation for everything. It's an ending that leaves you thinking, and I personally love those kinds of things. It does lend depth to the rest of the game, but it doesn't overshadow the fact that we were kept in the dark up until that point. More foreshadowing and perhaps a few more explanations would have kept the entire tale interesting, as opposed to confusing right up until the end. If you're a fan of stories that leave you with something to think about, and a commentary on the world we live in, then you'll find a lot to like in Here They Lie. Just don't expect it to make complete sense, and don't expect much exposition throughout the strange and beautiful adventure. Here They Lie is most certainly a horror game. The imagery, the events that play out before you, they're all scary. Even the enemies are scary at first, but unfortunately they follow the same path as Resident Evil VII and lack variety in their design. Throughout the adventure there are two different types of enemies, and you'll see one far more than you'll see the other. At first, they can be terrifying, but by the end they become nothing more than moving obstacles that can sometimes walk in frustratingly small circles, making them hard to avoid. Since you can't fight back, I was relieved when I discovered Here They Lie doesn't really punish you for dying. You simply go through a surreal loading screen of sorts and then walk out of a door in the area you were just moments before. You have a flashlight, the ability to collect batteries, and a sprint button. Beyond small other interactions, the game doesn't have a lot in terms of interactivity, but that's not a problem when the visuals and story are picking up the pace. In Here They Lie, the visuals are there, but the story doesn't have a steady progression to warrant the methodical pacing. I did enjoy the variety in the locales, but there were several larger locations where everything kind of looked similar after a while and I found myself getting woefully lost. Worse, in my efforts to try and find the correct path forward, I caught the ire of the enemies who would relentlessly chase me. In a game with a lot of movement, running around in VR is a recipe for a bad time. Standard gameplay in Here They Lie didn't bother me too much, but I've heard plenty of reports that people got naseous. In a game like this that gives you free movement, it's going to happen. When you're lost running in circles for long periods of time, it's going to aggravate the issue. With the new patch, you can play the game on a standard screen in resolutions up to 4K on PS4 Pro. The game looks nice and plays well in this mode, but after experiencing it in VR, it's just not as compelling on a standard TV. Again, this is a result of the pacing and the lack of consistent story development. Still, it does look great on a TV, so the option is appreciated. You can switch between the modes seamlessly as well, giving you the option to play outside of VR without having to sacrifice progress. I appreciated this, along with the level select option once you've finished the game. In the end, Here They Lie's gameplay falls into the category of other titles like Dear Esther and Layers of Fear, but it doesn't back up it's incredibly unique environments with compelling enemies, gameplay, or consistent story progression, which is something other titles have managed just fine. I think having the choice to play in or out of VR will result in many more people finishing Here They Lie since they can switch if they get sick, but the flaws still remain, along with some infuriating moments where you'll get lost because of a total lack of guidance as to where you're supposed to go. Visually, Here They Lie is awesome. The environments are nice and varied, and the imagery is spot on in terms of artistic value. It's has a few jump scares, but most of the horror in the game comes from a solid atmosphere and a crushing sense of lonlieness. On a TV screen, the graphics are crisp and sharp. In VR, we have to expect a downturn in quality, but after the latest update PS4 Pro does a markedly improved job of keeping the fidelity intact. Things in the distance are still pretty muddled and blurry, but the up close graphics and lighting have massively improved, which makes the game far more enjoyable in VR on a PS4 Pro. Nausea will undoubtedly rear its head, but that's the nature of the beast, and not really the developer's fault. Yes, they could have made Here They Lie a point-and-click, but it benefits from a freedom of movement. In the end, Here They Lie is a mixed bag. On the one hand, you have awesome imagery, crazy designs, and a genuinely profound story. The only problem is that the story doesn't pay off until the very end, and the moment-to-moment gameplay can get old or downright frustrating when you get lost. The option to play in or out of VR ensures that more people can experience it, and the PS4 Pro support is a welcome addition to the fidelity. At $20, it's cool if you're a diehard fan of surreal exploration games, but others may want to wait for a sale before jumping in.